What’s behind Metro’s fare-hike, service-cut proposals? 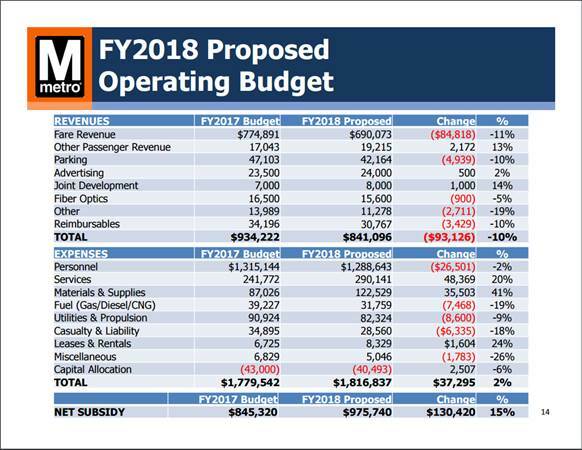 Fares and tax contributions to the operating budget have not increased in a few years, but Metro General Manager Paul Wiedefeld’s proposed budget suggests increasing both, as well as increasing wait times for trains and reducing bus service. See the proposed changes. WASHINGTON — Metro ridership is falling, and the general manager says that dropoff is a major reason service should be cut back, fares should be raised and local jurisdictions should contribute more money. Fares and tax contributions to the operating budget have not increased in a few years, but Paul Wiedefeld’s proposed budget, released Monday, suggests increasing both, and increasing wait times for trains at the end of the lines from a scheduled six minutes to eight minutes at rush hour. In just the last three months, ridership is down 10 percent compared to last year on both bus and rail, with a sharper decline in the rail system. Wiedefeld’s $1.817 billion proposed budget for the 12 months starting next July now factors in even more significant ridership drops, with a majority of the funding coming from the jurisdictions. A projected $841 million would come from riders paying higher fares and parking fees, plus other revenue sources such as advertising. The Metro board of directors is expected to hold a public hearing and comment period on the budget proposals in January and February, with a final vote in March. Board members are sharply divided on a number of the proposals. With Metrorail ridership down from about 750,000 trips each weekday in 2009 to closer to 600,000 trips each weekday in the past year, Wiedefeld wants to cut back the number of trains scheduled. At rush hour, trains would run every eight minutes from end-of-the-line stations, which would reduce the number of trains scheduled to serve those stations from 10 per hour to about seven or eight. In addition to saving money, Metro hopes the changes could help ensure trains actually run on schedule. Outside rush hour, only four trains per hour would be scheduled on all lines, and every other Red Line train would end at Grosvenor-Strathmore rather than Shady Grove. The changes would reduce the number of train operators needed, as well as maintenance needs and power costs. While Metro projects the moves would cut ridership even further at off hours, they’re projected to provide a net savings of about $12 million. On the roads, several bus routes, including some routes with more than 20 riders per trip, would be cut under the proposal. The rush-hour Route 37, along Wisconsin and Massachusetts avenues in Northwest, carries about 27 riders per trip; the P17, P18 and P19 Oxon Hill-Fort Washington line carries about 21 riders per trip, and the W13 and W14 Bock Road line in Maryland carries about 19 riders per trip, but all would be among 14 lines cut in the proposal. Wiedefeld also proposes ending the B30 bus service between the Greenbelt Metro and BWI-Marshall Airport, of which riders pay about 40 percent of the costs. The routes that would be cut were measured based on subsidy per rider and riders per mile. In some cases, the costs are high because buses are sent back to the garage out of service, or have a long way to go to reach the routes. Altogether, Metro estimates the altered bus routes would cut $17 million from the budget. It is possible that some local bus operators could decide to run certain routes without Metro, but that is mainly an option for Montgomery County’s RideOn service or several of the local bus operators in Virginia. Proposed fare increases would affect riders on all parts of the system and include an increase in parking fees, too. Metro projects the fare increases would lead to 10 million fewer trips taken on the system next fiscal year, but still add $21 million in new revenue. MetroAccess fares remain twice the fastest comparable fixed-route fare. The minimum fare would increase along with the base bus fare from $3.50 to $4. The maximum fare would remain at $6.50. Metro last raised fares in the summer of 2014. The last two years, the tax contributions from local jurisdictions have remained flat. “While any increase will be unpopular with riders and is likely to result in a decline in total ridership, the necessity of generating adequate revenue must be balanced against the ridership impact,” documents prepared for the Metro Board say. The sharp declines in ridership are already hitting Metro’s current year budget, even before Metro considers fiscal year 2018. Metro now projects that it will get $100 million less than expected this fiscal year from fares and parking fees. Adding the proposed service cuts to the proposed fare increases, Metro projects total ridership would drop by about 15 million trips next fiscal year. In initial budget summary documents for Metro’s board, Wiedefeld highlighted that his budget plan would cut 1,000 jobs; however, that number includes many that were previously announced. About 500 of those cuts were announced in June, and the 372 that have been cut so far have mainly been positions that were empty anyway. This week, Metro is notifying the first of about 100 employees who are losing their jobs. Of the 500 additional cuts proposed, Wiedefeld expects about 300 would be bus and rail operators, mechanics, supervisors and administrators who would no longer have work to do if trains and buses are running less often, while 200 other positions would be cut by consolidating some back-office jobs and other management changes. The budget proposal would lower the total Metro workforce to about 12,054 people across the region. A major risk in the budget is the lack of money to address likely raises for union workers, who are negotiating a new contract with Metro. Metro leaders are more optimistic, building in assumptions that ridership will begin to rebound, “albeit slowly,” by 2018 or 2019. Forecasts also bank on the second phase of the Silver Line, to Loudoun County and Dulles Airport, drawing in more riders beginning in 2020. That revenue forecast also counts on the Metro Board increasing fares every other year.